I am currently digging in some books to understand the three major metabolic pathways involved in physical training. The most difficult one for me is the glycolytic non-oxidative pathway (also more commonly known as the anaerobic lactic pathway) and I would like some help from people versed in this field. In this pathway, as far as I understand, glycolysis produces pyruvate. In this process, NADH and H+ ions are produced along the way. Then, if there is still a high energy demand (i.e. 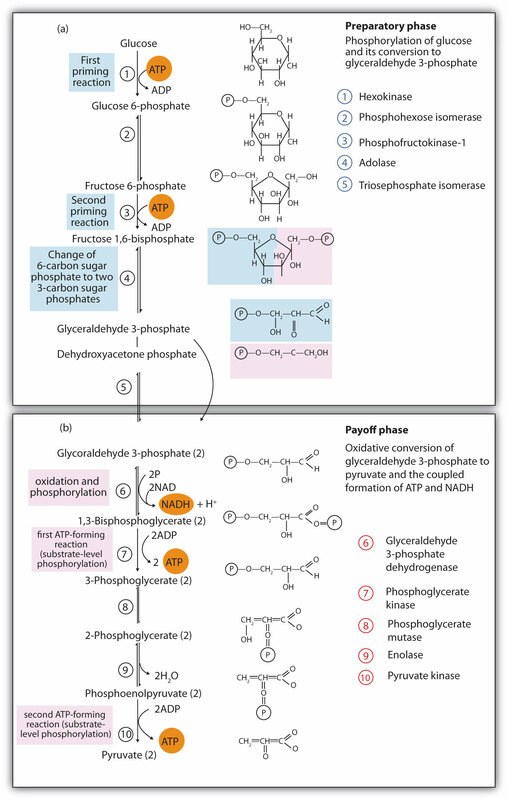 glycolysis is still necessary); NADH binds with pyruvate to form lactate and free up NAD+ which is necessary to sustain the glycolysis (otherwhise, pyruvate would be consumed via an oxidative pathway i.e. oxidative glycosis or slow glycolysis). This can theoretically continue until glycogen is depleted or severely diminished as far as I understand. Why, during high intensity exercise, would oxygen be insufficient to take care of the H+ ions produced by the glycolysis ? Is it because muscles used during high intensity are not the best ones for using/transporting oxygen? Is it also because these H+ ions cannot be transported towards neighbouring muscles able to oxidise H+ ions ? I understand this is a difficult question and maybe there is no precise answer at the moment. If you could point me toward a good ressource that deals with this question, I would be glad. I currently base myself on McArdle book on exercise physiology. This question came from our site for physical fitness professionals, athletes, trainers, and those providing health-related needs. I am going to try to walk through this problem, in a step-by-step manner in relation to exercise, starting from at rest, and ending at the point in which the body is no longer able to maintain its energy-charge. The body mainly utilises oxidative phosphorylation to maintain its energy-demands. In cells where great amounts of energy need to be produced very quickly, eg. cells that are actively replicating, glycolysis is the preferred mode of energy production because this pathway is able to very quickly produce large amounts of ATP, and lactate is able to quickly diffuse in to the bloodstream. Lactate will travel in the bloodstream, to the liver, to be recycled back to glucose through an anabolic process called gluconeogenesis. This recycling pathway is known as the Cori-cycle. Essentially, what is happening is, parts of the body that are in need of high amounts of energy, will "dump" their wastes to the bloodstream, to be dealt with by other organs. Science and Skiing VI, 2015, pp 17-30. George Brooks of the University of California summarises lactate recycling quite nicely here. Muscle cells will begin to quickly utilise ATP-stores, and release glucose from the glycogen-stores, and release oxygen-stores from myoglobin. As these stores begin to become depleted, the body will begin to go in to overdrive, in an attempt to restore itself to a resting-state. Thus, your heart-rate will increase, breathing will become faster, and glycolytic pathways will be activated through feed-forward mechanisms. I have touched on this before, in another post that you may find interesting. I believe that if you read through this though, that you will understand why there is low levels of oxygen, and what the body does to attempt to circumvent this. There will be very low levels of oxygen throughout the active tissues. The body will do everything it can to try to restore this, but it will ultimately fail to do so. Thus, the only real option it has is to rely on glycolysis in the tissues that are causing "problems". The rate of ATP-production is most dependent on the rate at which a cell can take glucose in to the cell. The electron-transport-chain is only able to synthesise ATP at its maximum velocity - this maximum velocity is proportional to the concentration of oxygen. The rate of glycolysis is, however, essentially, only affected by the rate at which lactate can be removed from the cell and the rate at which glucose can be absorbed by the cell. Of course, the muscles that are being used will only be concerned with producing energy. 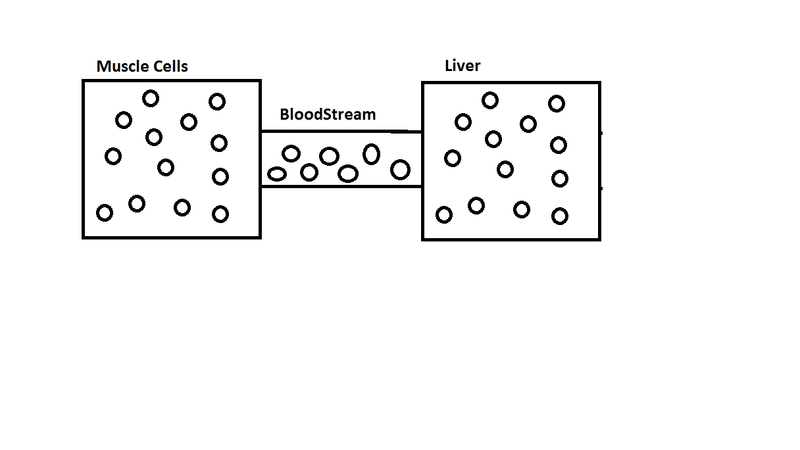 Therefore, all of the lactate that they produce will be dumped in to the bloodstream, where it will travel to the liver, in the previously mentioned cori cycle. Overall, the issue is not in the muscle-cell's ability to regenerate NAD+. This is the easy part, seeing as there is no net-change in the concentration of NAD+ when glucose is converted to lactic acid. And also, things such as malate-aspartate shuttles, citrate-pyruvate shuttles, and glycerol 3-Phosphate shuttles can be used to maintain redox-balance. These are only but a few examples of how to maintain redox-balance. You must also remember that carbohydrates are not the only class of molecules involved in these cycles; degraded proteins and fats can also be used to supply the TCA-cycle with alternative means of energy-production. Pyruvate probably would not even be able to be converted in to acetyl-CoA anyway, since pyruvate dehydrogenase requires the presence of oxygen to function. Problems however do arise once the body is unable to deal with all of the waste that it is producing. There will reach a point, where the liver cells will be physically incapable of accepting any new lactate-molecules. And so, lactate will accumulate in the bloodstream. With an accumulation of lactate in the bloodstream, lactate will be unable to diffuse to the outside of the cell. Thus, cells will be unable to convert pyruvate in to lactate. I tried to make a little illustration of what I mean above, below. Hope this helps to conceptualize it. 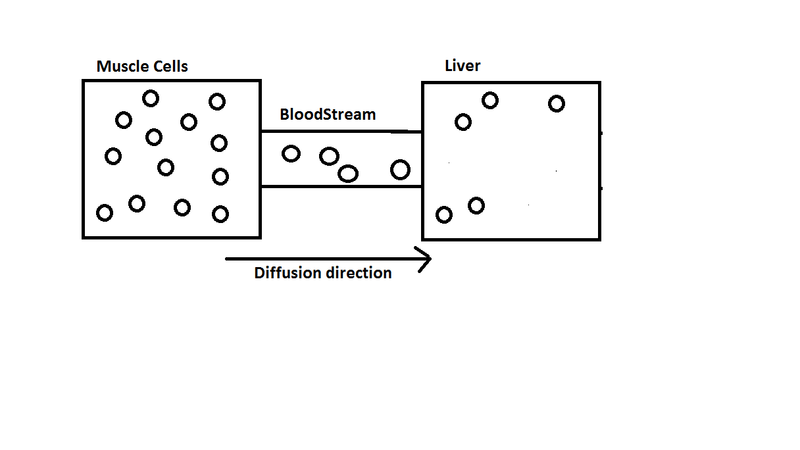 In this second picture, there is too much lactate for diffusion to occur. "These maximum values of JATPglyc and JATPox define the bioenergetic capacity of the cells. As shown in Fig. 5D, the maximum individual capacities of JATPglyc and JATPox in the bioenergetic space plot intersect at (62.5, 46.5) for a theoretical maximum bioenergetic capacity of 62.5 + 46.5 = 109.0 pmol of ATP/min/μg of protein. At this maximum point, the glycolytic index (GImax capacity) would be 62.5/109 = 57.3%, making C2C12 myoblasts primarily glycolytic when running at their maximum ATP production rate. Compared with the actual value of JATP production in the presence of glucose (55.2), the bioenergetic capacity was 109/55.2 = 197% of the rate with glucose (Fig. 5D). This bioenergetic capacity of 197% of the rate with glucose (alternatively, a reserve capacity of 109.0 − 55.2 = 53.8 pmol of ATP/min/μg of protein) reveals that the C2C12 cells under our experimental assay conditions with added glucose were operating comfortably within their capacity to generate ATP and were well set up to respond to any acute increases in ATP demand by increasing either glycolytic or oxidative ATP production, or both." In these experiments, the researchers were trying to figure out what proportion of ATP would be created by glycolytic and oxidative pathways in muscle cells (and other cell-types). Their findings, were that, indeed, the majority of ATP production in muscle cells comes from glycolysis. During exercise, this difference in amounts of ATP production between glycolysis and oxidative phosphorylation would probably be even greater. Fantastic question! Hopefully this somewhat helps. It's very difficult to simply this process as it's quite complex. The rate of use exceeds the at which it becomes available. So the respiratory chain cannot process all of the H+ joined to NADH. 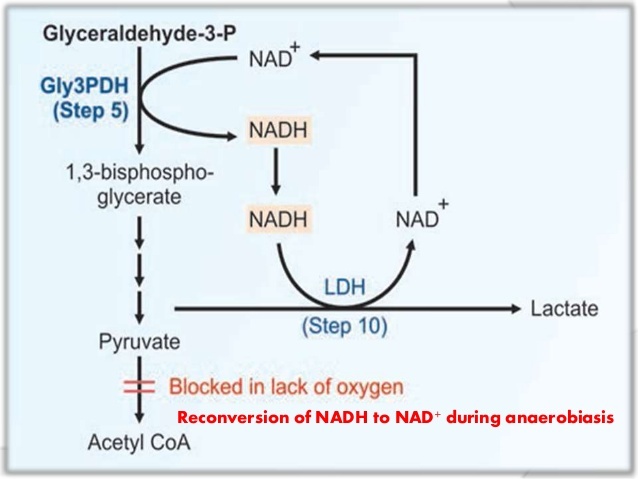 Continued release of anaerobic energy during glycolysis depends on NAD+'s availability to oxidize 3-phosphoglyceraldehyde -- otherwise glycolysis grinds to a halt. 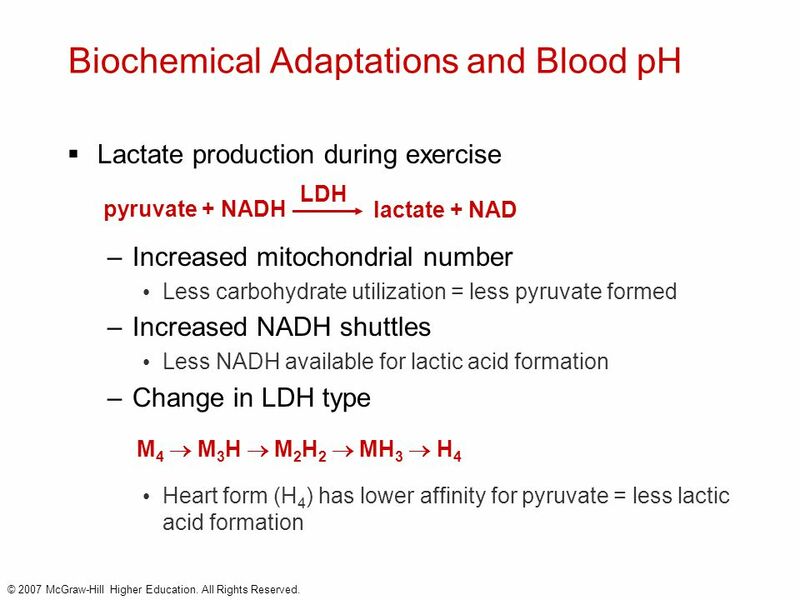 During anaerobic glycolysis -- NAD+ "frees up" when excess hydrogen's combine temporarily with pyruvate to form lactate. Lactate formation requires one additional step catalyzed by lactate dehydrogenase. The storage of H+ with pyruvate represents a temporary "collector" of the end product of anaerobic glycolysis. Once lactate is formed it diffuses away into the interstitial space and blood for buffering and removal. However, this avenue for energy is temporary. Blood lactate and muscle lactate levels increase and ATP regeneration fails to keep pace with the rate of use. Fatigue sets in and performance diminishes. Increasing the concentration of free H+ ions = lowers the pH (so a pH of 1 is very acidic and has a very high concentration of free H+ ions, a PH of say 9 has a lower concentration of H+ ions and is less acidic). Oxidation is losing electrons – reduction is gaining electrons. Several key steps in the oxidation of glucose to pyruvate involve the reduction of the electron/energy shuttle NAD+ to NADH. It's required to reoxidize the NADH to NAD+ in order to avoid consuming the available pools of NAD+ and to thus avoid stopping glycolysis. 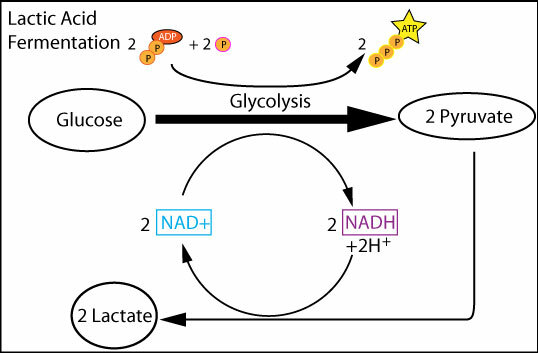 Put differently, during glycolysis, cells can generate large amounts of NADH and slowly exhaust their supplies of NAD+. If glycolysis is to continue, the cell must find a way to regenerate NAD+, either by synthesis or by some form of recycling. So these slides will have to do for now (best I have available to post). Put very simply in anaerobic conditions - there comes a point where there is not enough NAD+ available to convert pyruvate to lactate. Would H+ ions just accumulate and increase local acidosis? Not the answer you're looking for? Browse other questions tagged metabolism energy physiology or ask your own question. Why insects are so energy-efficient while flying? Does Glycolysis produce lactate, or pyruvate? How does heart beat faster while doing a strenuous task? Bilirubin metabolism pathway in non-human primates (NHP)? What is the evidence that mammals are unable to process excess sodium chloride? Why is the hexose monophosphate shunt called a direct oxidative pathway? How is the rate of gluconeogenesis controlled in the cell? What is the fate of NADH produced in the liver during oxidation of lactic acid? What chemical conversions are involved , and what's the name for the process, when the muscles use lactate as an energy source?